Special mention goes out to this place as this pub serves the most consistently amazing Guinness in the city. I have never got a bogey pint here, in fact, I’ve never got anything less than a 4/4! This visit was no exception. The pint settles outrageously creamily, it’s delight to behold. The glass is cold & damp to hold & the floppy-touch of that cream on the upper lip is like landing face down in a cloud. The flavour is exactly as I expect from my pint of Guinness; pure tasty blackness, so cool & drinkable. 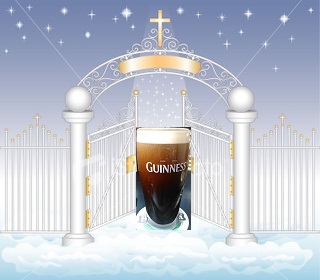 If St. Peter lets me through the pearly gates, I want to be met by a freshly poured Mulligans pint on the other side. This is Guinness as it should be. If you want to taste Guinness, this is the place for you, this is G-heaven.